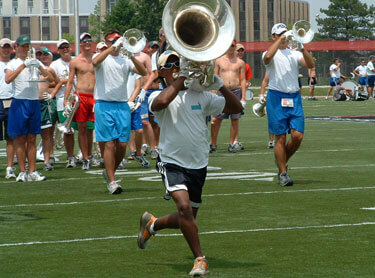 Members of the 2005 Blue Knights horn line warm up before a music rehearsal. Blue Devils' John Bradford works with a corps member during an informational session presented at the DCI judge's seminar in June, 2006. 2006 Phantom Regiment members do push up reps during a summer rehearsal. into a marching basics rehearsal. Phantom Regiment members grab their water jugs on a rehearsal break during the 2006 season. It is extremely important that you make a conscious effort to hydrate yourself. This is true at any level and whether you are playing your instrument or participating in a strength and conditioning program. Sports drinks are fine to substitute lost nutrients from exertion, but you should take note to always drink plenty of water. Learn about products and educational materials offered by Drum Corps International and the Institute of Health and Human Performance that can help get you on your way to preventing injuries, enhancing performance and following a healthy lifestyle. Consult a physician before beginning any exercise program.